A 100th Birthday Party helped Eileen Carender and Edna Kouns celebrate an event that most folks do not get to experience. One hundred years is a long time to be around Lakeside. 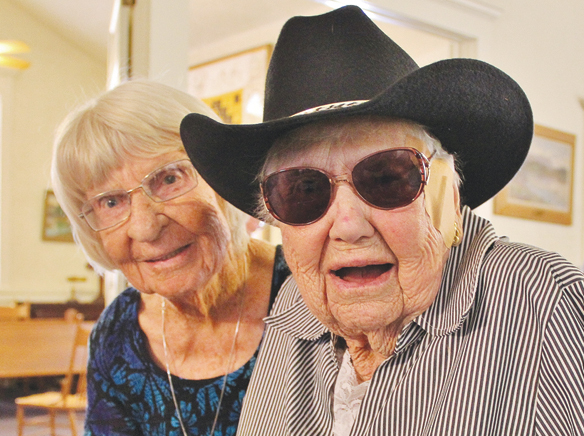 Eileen Carender and Edna Kouns daughters, Virginia Embry and Dixie Landsdown, hosted a 100th birthday party for the centurions on June 15 at the Olde Community Church, home to the Lakeside Historical Society. Embry said more than 350 friends and relatives joined in the fun. They traveled from far and wide, Montana, Colorado, Washington, Arizona, Alaska, Idaho, Kansas and even Lakeside to attend the celebration of two lifetimes. Memories were shared and a lot of laughter was heard. Landsdown said it was like a hometown reunion within and reunion with so many memories relived. Kouns had relatives camping in her little house all week. “They were sleeping all over the house on the floor,” she said. Pastor Bob Mentz, from Lakeside Presbyterian Church presented a Praise Quilt to honor each birthday girl, they had been lovingly hand made by the members of the church. Kouns and Carender have been friends since they met in the 8th grade at Lakeside Grammar School. Carender said that she rode the bus to Grossmont High School along Highway 80 which was then a dirt road. They later graduated from Grossmont, class of 1932. Kouns attended the University of Redlands for two years. Carender married Dane Carender in 1935, they have three chrilden, Dixie, Cecil and Kathleen. As youth, they both attended the Community Church and were active in local activities. Their Sunday school class planted little twigs that grew into the large and lovely Carob Trees that line Maine Avenue today. They hauled wood by horse and wagon to use to heat the church on cold winter days. Carender has lived in Lakeside her whole life but Kouns moved away for a few years when Hatfield the Rainmaker’s flood destroyed their home in El Monte Valley. She was just a baby but said her family took the horse and buggy and along with some cows and everything they owned and went to Imperial Valley where it was dry. Eventually they came back to Lakeside where it was cool. Last April the birthday girls were honored by riding in a horse drawn buggy in the Lakeside Western Days Parade wearing their pioneer costumes, Cousins Donna and John Swink rode with them. Billy Ortiz organized the entry, Pam Wilmers, Cindy Helms, Melissa Mason and Grace Parrot accompanied them on horseback, their entry won the Grand Marshal’s Award for the Historical Society. Daughters, Embry and Landsdown agreed it was wonderful to see all the different age groups at the birthday party that have loved and supported their mothers during their lifetime. For further historical information go to the Lakeside Historical Society’s website or Facebook.